Tuisong is an architecturally designed self contained and self catering apartment, occupying the entire ground floor level of our home. It comprises a fully equipped kitchen, separate living room, partitioned bedroom, and a compact 'accessible' (wet floor) bathroom. 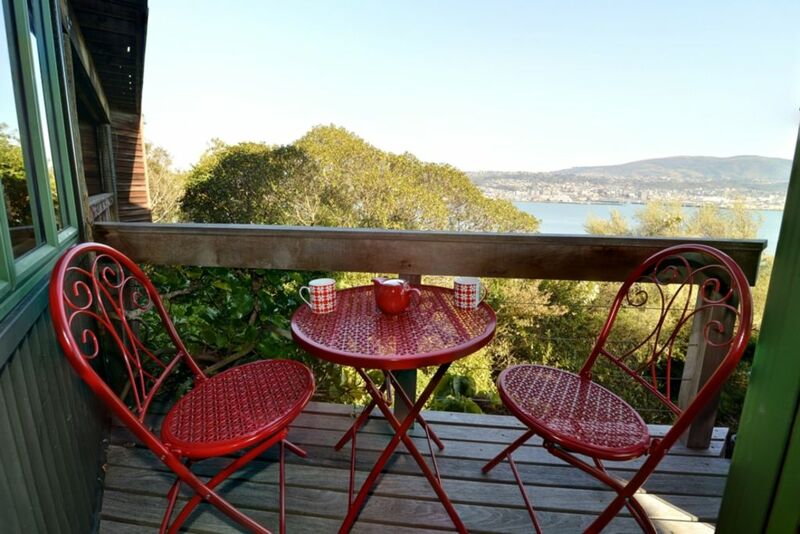 It is set amidst a substantial stand of native bush, yet still has uninterrupted, panoramic views over Otago harbour and Dunedin City. Those views are enhanced when seen from the open air balcony, which provides a secluded and peaceful place for relaxation. The North Westerly aspect captures maximum sunshine, daily. The apartment has a separate entrance, and an off street car park is provided. The owner/managers always respect their guest's privacy, but are readily available to meet any needs, respond to any enquiries and make recommendations as to dining, local attractions and entertainment. Should the owner/managers be absent from the property, arrangements are always made to fully provide for guests. Vauxhall is a lovely, quiet and sunny residential neighbourhood. It's an ideal location for exploring the City (just 10 minutes drive to the Octagon), and all of the Peninsula attractions. (Beaches, Albatross colony, Yellow eyed penguin sanctuaries, etc...) The Edgar Sports Centre is 10 minutes walk, and Forsyth Barr Stadium and the University Oval are also just a 10 minute drive away. Please Note: A two night minimum stay condition applies to this property. We have off street parking available for one vehicle. Please note that the flat is accessed via some steps. This lovely place has everything you need - a full kitchen as well as a separate living area, bedroom and bathroom - but the spectacular view is what I loved most. A quiet, private location very close to the city. I will definitely be back. Thanks Amanda. Although in a quiet, exclusive, bush clad cul-de-sac, you wouldn't know there's another house within miles. Peaceful and secluded during the day with abundant bird life, the light show at night across a glassy harbour was amazing. Exceedingly well equipped (we arrived well over-prepared) and comfortably furnished - the SKY and WIFI was a bonus. Top marks Amanda, for being such a friendly and informative host. We'll be back!! Lovely unit, nicely furnished and prepared. Great views and friendly hosts. We would stay again with no hesitation and recommend to any couple. Great space, generous hosts; stunning view. We thoroughly enjoyed our stay. Tuisong was spotless and well supplied. It is located in a very quiet neighborhood, with a very short, easy drive into town. We will definitely stay there again when we are in Dunedin. Beautiful area, apartment and view. The apartment was as good as the view. The area is quiet, yet minutes away from everything. The apartment has every modern convenience as is beautifully presented.